Authors: 1) Rahul Kashyap et al., 2) Daniel R. Van Rossum et al. In the far reaches of the Universe, an unprecedented light show outshining an entire galaxy happens once every century for every galaxy resembling our own. This spectacular firework display — known as a supernova — marks the end of a star’s life. The energy emitted can power up the entire world for the next 1027 years! Besides their tremendous energy output, supernovae act as standard candles that allow us to measure various cosmological parameters. They also seed the conception of new stars by recycling back star-birthing chemical elements into the interstellar medium. Speaking of chemicals, ever wonder why elements such as chlorine, potassium, sodium, and many others exist at all in nature? These elements can only be created during the searingly hot explosive instant of a supernova. So next time you’re eating a banana or enjoying a dip in the pool, think about these incredible explosions. If we categorize supernovae based on their light curves and spectra, we end up with a zoo of supernova variety. Today we’ll focus on different supernovae population based on their progenitor, i.e. the type of stellar system causing the explosion. In this scenario, we have core collapse supernovae on the one hand and Type Ia supernovae on the other. Core collapse supernova is caused by the implosion of the core of a massive star (> 8 ) while Type Ia supernova is the result of … uhm, well we are not quite sure yet. It has long been suggested that a white dwarf in a binary system with a main sequence star or a red giant could give rise to Type Ia supernova via accretion of the companion onto the white dwarf. This accretion would increase the mass of the white dwarf until it reaches the Chandrasekhar limit (1.4 ), beyond which it becomes unstable and consequently explodes. This is the single-degenerate model. A competing model, the double-degenerate model, proposes the progenitors to be mergers of white dwarf-white dwarf binaries. Both models have their own challenges to overcome and observational evidences are split between the two (eg, check this astrobite out). In choosing their favorite model, most astronomers are on the fence or at loggerheads (civilly, of course). Despite founded by sound theoretical principles, the major hurdle to the double-degenerate model is that the most extensive numerical studies failed to reproduce what nature achieves so seamlessly — the stars won’t explode. Today we’re going double-degenerate, and finally exploding. The authors of today’s first paper simulated the merger of a 1 and 1.1 white dwarf-white dwarf binary system. All was dead and quiet at the onset of their simulation, as found by other numerical studies. However as they followed the merger longer in time (longer than other studies), an interesting phenomenon takes places. Tidal disruption of the secondary started to cause instabilities in the form of spiral modes in the inner accretion disk of the merger. Why did previous simulations fail to make their stars explode? This is because their primary white dwarfs remain largely unheated during the merging process and so they just aren’t hot enough to detonate. On the other hand, the spiral instability produced here act to funnel in hot materials from the inner disk to the primary white dwarf, heating it up to the critical temperature necessary to achieve an outburst. This outburst would then escalate to a supernova explosion. For different takes on what might detonate a merging white dwarf binary, check this or this astrobite. Figure 1 shows the connection between the spiral instability to the accretion flow that drives in hot materials. We’ve finally obtained that glorious boom, but this is not the end. We want to investigate how this particular explosion stand in the test of observations. Does everything check out? The authors of the second paper simulated the light curves and spectra of the resultant supernova. 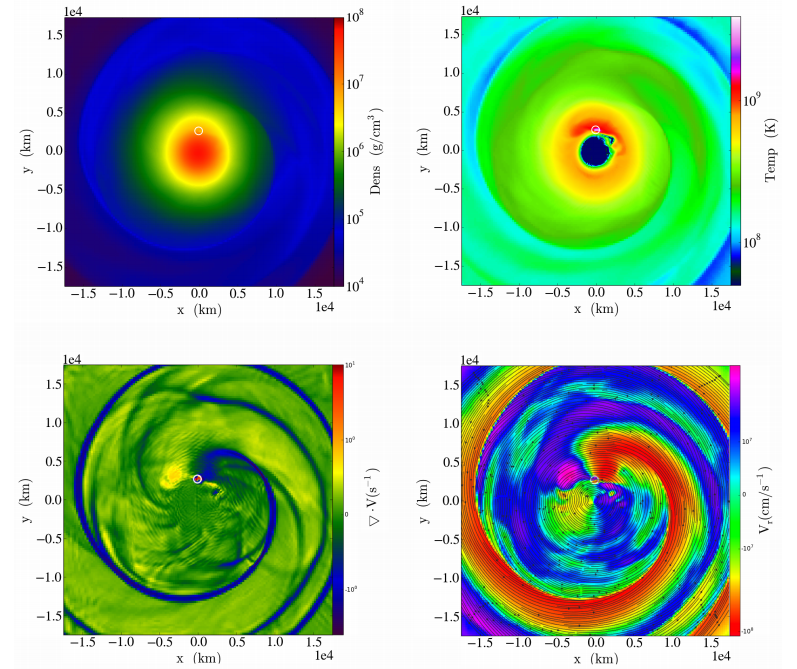 They adopted the same spiral merger model using the same binary system parameters. Figure 2 shows the spatial distribution of the ejected materials, color-coded by chemical elements. Note the symmetry of the ejected materials at z = 0 (plane of the accretion disk), which leads to light curves and spectra with a moderate dependence on viewing angle, in agreement with observations. Figure 3 shows the simulated bolometric light curves for different viewing angles. The light curves reflect a north-south symmetry (navy line overlapping with purple line; blue line overlapping with green line), again pointing to the spatial symmetry of the ejected materials. 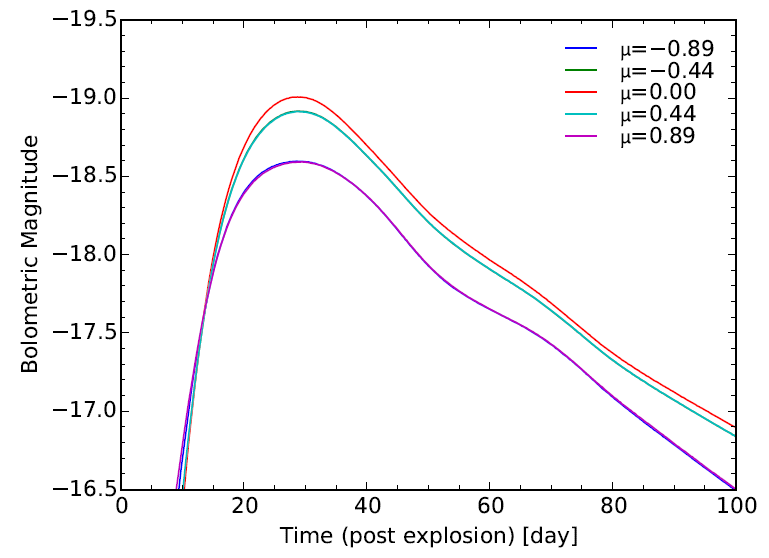 The bolometric luminosity peaks around the 30th day post explosion, ~10 days late compared to typical Type Ia supernovae. Most white dwarfs have a mass of 0.6 , and the large mass of the merging system here causes the ejecta to expand more slowly such that light from the core also leaks out at a later time. However, this light curve behavior resembles a rare family of very slowly-declining normal Type Ia’s. Bear in mind that these results are just for one particular double-degenerate system, one with a total mass of 2.1 . The authors suggest that the massive spiral merger considered here and the subgroup of normal slowly-declining Type Ia supernovae may be the tip of the iceberg; to create light curves and spectra consistent with the majority of normal Type Ia’s would require a lower mass binary system. Therefore, however much we’d like it to be, this is not quite the home run. More (hard) work remains to be done before we can close the curtain on the mystery behind the progenitors of Type Ia supernovae.